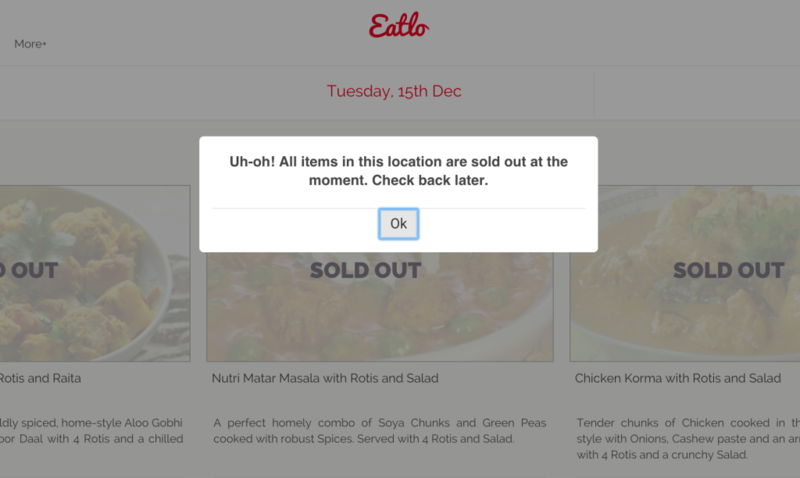 Bangalore based food tech startup Eatlo has not been operating since 15th December 2015. The app has been throwing up an error message when users try to log in. The menu on the homepage has also not been updated since then. Eatlo was founded in 2014 by IIT Bombay alumni Rahul Harkisanka and Sai Priya Mahajan. It delivers freshly cooked meals to users in Bangalore and boasts of a daily changing menu. It is one of the 18 food tech startups in India reviewed by our team at OfficeChai. It has a team of 100 employees, 60 of which are in the operations and delivery teams. In an interview with ET, Harkisanka had said the company had money to sustain for another 9-12 months, while it was in the market to raise a fresh round. However since December 2015, all activity on the company’s Facebook and Twitter pages has stopped. The user helplines and the contact email addresses have elicited no response. Curiously, there’s no physical address listed on the company’s website. Worried customers have been trying to reach the company, but to no avail. “I have money in my Eatlo wallet, and I don’t know what’s going to happen to it.”, said Gaurav S, a regular customer. India’s food tech industry has been in turmoil over the last few months. [Video]. Zomato and TinyOwl have laid off large numbers of employees, while Dazo and Spoonjoy have shut down. Update: A delivery person at Eatlo has confirmed that the company has been shut down.